Derry City caretaker boss Paul Hegarty will see how his team's relegation battle goes before making any decisions on a possible permanent appointment. Hegarty will manage the struggling Candystripes until the end of the season after the club parted company with Peter Hutton on Tuesday night. 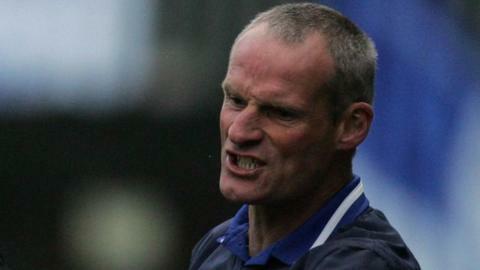 Club chairman Philip O'Doherty said on Wednesday that he hopes Hegarty will still be in charge next season. However, Hegarty was non-committal on the issue in a Radio Foyle interview. "I had a conversation with Philip last night and I appreciate the offer," said former Institute boss Hegarty, who was serving his third stint as Derry assistant after being appointed in July. "But as it stands at the minute, I'm looking nothing further than the Shamrock Rovers match and the other games before the end of the season. "If things go well, we can sit down and assess matters at the end of the season." Hegarty spoke to Hutton after Tuesday night's development and said that the former manager "was very down" following his departure. "But you have to move on and he understands that himself," added Hegarty. "It will be tough for him for a few weeks to get his head around it but that's the way football is." "I've been friendly with Peter for a long, long time and I played along with him as well." Derry have won just six of their 27 league games this season and are just three points clear of basement side Limerick. Hutton's final match in charge came on Monday in the 3-0 FAI quarter-final replay loss against Cork City at Turner's Cross. However, chairman O'Doherty said that the league defeat by Drogheda United on 5 September convinced him that Hutton's time was up. "We basically surrendered. It was probably the most important game of the season which if we won would probably have left us safe," the Derry chairman told BBC Radio Foyle. "You could argue whether it could have been done sooner or if it could have been done later. "We wanted to give him the chance to win against Cork in the Cup game. It would have got us into the semi-finals and it was our last chance for European qualification. "We were left with no other option. With six games to go we have six Cup finals now over the next few weeks."